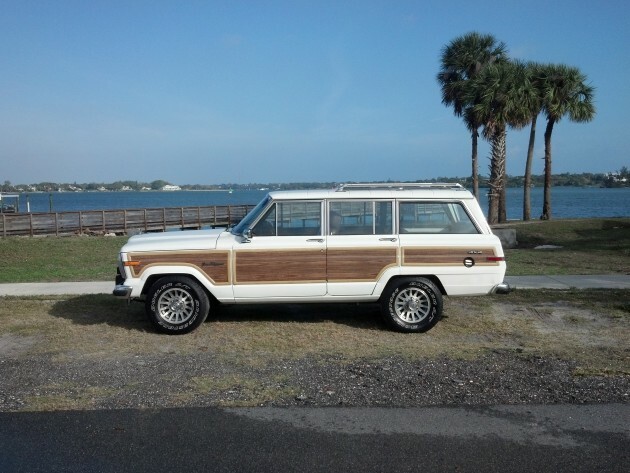 Hello and Thank You for visiting our latest listing of another Classic Jeep Grand Wagoneer! This is a 1989 White with Cordovan Interior. Has LOW MILEAGE….100,352 MILES!!! Very good for a 1989!!! This was bought at an Estate Sale from the owner of AMC Chason Motors Jeep in Stuart, FL, who passed away in October 2012. It is a ONE OWNER and was a Daily Driver. Have Original Title and Books from 1989!!! All the electrics and 4 X 4 work. Tailgate works both inside with switch and outside with key. AC blows Ice Cold. Has Factory Radio. Runs Smooth and Drives Great! This Classic is Mechanically Sound! Paint is FACTORY ORIGINAL!! MOST IMPORTANTLY…..NEVER BEEN IN A WRECK….HAS GREAT AUTOCHECK SCORE!!!! BE SURE TO VISIT MY STORE FOR OTHER ITEMS FOR SALE!!! YOU CAN ALSO VISIT US AT THE MOTOR MASTERS!!!! BUY WITH CONFIDENCE….I HAVE A 100% POSITIVE FEEDBACK RATING!!!! !